The plantar plate is a cartilage sling that is the only thing that provides side-to-side stability to the middle toes of the foot. If it tears, the toes can deviate creating a V gap between the toes, almost always between 2nd and 3rd toes or the 3rd and 4th toes. Who Gets it and Why ? 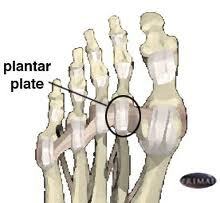 A plantar plate tear is commonly associated with a pronated or rolled in foot. This mechanical problem results in the biggest metatarsal bone failing to do its job properly and putting its share of weight onto the smaller bones of the lesser toes. Image 2 shows this pattern change. The excessive pressure causes a deterioration in the strength of the cartilage over several decades. Ultimately, it is usually a ‘small straw that broke the camels back’ event, perhaps even an ordinary step, which results in the tear. normal again by the use of orthotics.